- A board twenty inches long, and ten to twelve inches wide. The shirt is slipped over it and buttoned at the neck; at the other end of the board is a strip about an inch wide, fastened to the board by an arm at each end, running along the sides of the board. This strip is pushed down, one "flap" of the shirt drawn through between it and the end of the board, and then it is raised up so that its surface is again on a level with the board. It thus holds the shirt firmly in position while it is being ironed and polished. 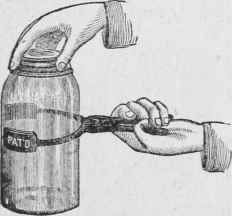 The Bain Marie is a very useful open vessel Which is kept tilled with hot (not boiling) water as the back of the stove or range or in some warm place. 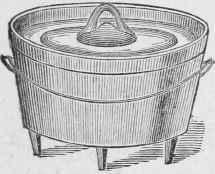 In this several stew pans, or large tin cups with covers and handles, are fitted in, which are intended to hold all the cooked dishes which are to be kept hot until the rest of the dinner is ready to serve. When a dinner is delayed, there is no better way of keeping all dishes hot, and preserving their flavor. 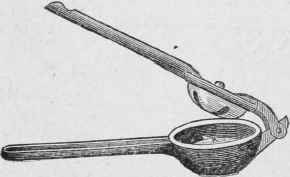 It is also convenient to keep sauces, and veget-ables used for garnishing meats, which can not be prepared at the last-minute.